Last edited by RickI; 05-16-2011 at 12:34 PM. You're kidding right? It started over ten years ago, countless kiteboarders begged for something like this to be forced down their throats. Ignoring simple rules, accidents, incidents, kites and kiters flying inland. ALL we had to do was mainly to ride outside the buoys AND to compel other kiters to do the same. This has been repeated countless times here, in meetings and at the beach. Way too few of us thought it was worth bothering with. This never happened at Hobie worse some of the most experienced among us rode feet off the shore routinely, some even told off deputies and the Causeway authority. Telling someone to F off or words to that effect to an authority you know is suffering serious heartburn with poor kiter behavior is really dumb. Instructors teaching students inside the bouys, ignoring bans on unlicensed commerce and common sense. How many in the community reacted to bring these folks in line to protect their access? Way too few, it didn't have to be this way. Stepping up to look out for your access tactfully and legally is becoming less of an option. Educate kiters, self-police and take care of business. LOTS of launches do this in other parts of the country it has been a more rare thing here. We're running out of launches so pay someone to mind our business for us at a couple of concessions or take on some responsibility like concerned people in the community ourselves. Last edited by RickI; 05-16-2011 at 12:39 PM. Bruno sent these images around. 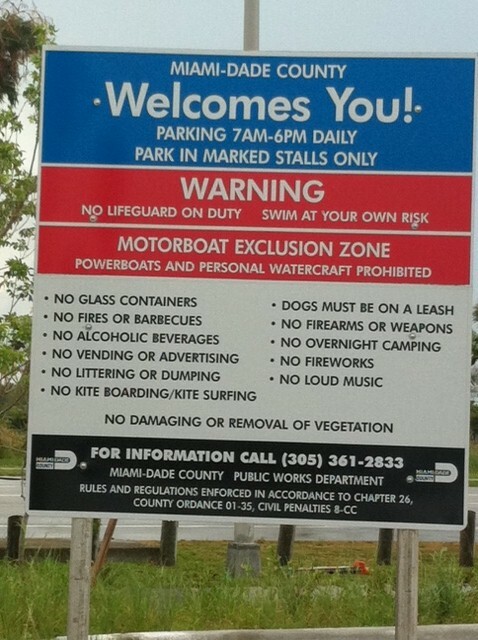 I was down in Key West for the paddleboard competition and just learned of the posting of signs last night on the way home. We have been warned so many times, too few of us tried to self-police. We were told months back the site would be posted. It would have been outstanding if the deputies had done more policing themselves but we were told early that likely would not happen. It was left up to us. Many areas around the state don't have problems like this. There may be lower numbers or more likely local riders self-police, something we need to do routinely. We met with the authorities many times including a number of times within the last year. A reasonable set of rules were worked out posted here and in other places on the Internet. I am two counties away so I hope riders pushed it at the beach where it counts the most. This result suggests that we didn't work at it effectively enough. Preserving access shouldn't be that hard. Usually there are a very few rules needed to do this. If we ignore our responsibility of helping to keep things going we can only blame ourselves in the end. In an ideal world someone else should take care of this, but it isn't that way and many of us knew this. So, pull together to try to preserve what little is left in Miami or drive to a managed concession. Other areas more to the north and south should take note. Keeping things going shouldn't be that hard but you need to go at it as a group. 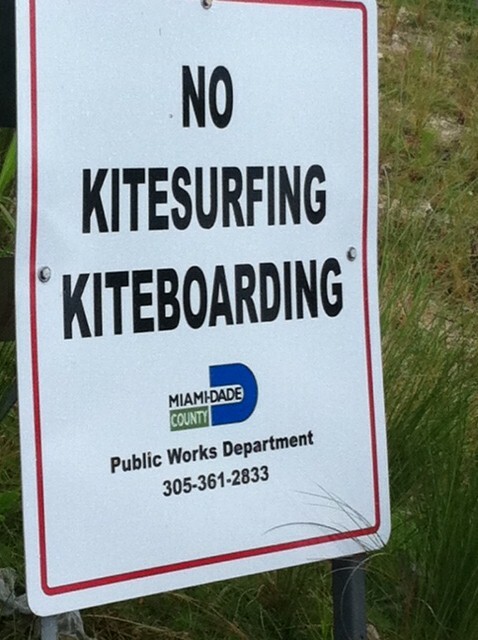 In many areas in SE Florida but not all, the MAIN thing needed is to KITE OUTSIDE THE SWIM ZONE BUOYS! Last edited by RickI; 05-16-2011 at 08:51 AM. There is a 1:1 relationship between the IQ of the rider at Hobie and the distance in M that they ride from the beach. This is why the beach is closed. I and many others spent hours and hours in meetings, trying to rally people together to follow a few simple rules. To put it in perspective, it's like having a road with a curb and sidewalk and the only rule is to not drive over the curb and on the sidewalk... At Hobie, most riders drove on the sidewalk!!! It also doesn't help that guys like Lubo (paddleboarding concession) were super annoyed that many instructors were teaching at Hobie Beach without a concession while he had to pay concession fees to be there for his paddling business. Nobody is happier about the beach closure than Lubo. I find it interesting that in an ironic twist, the winds blew like stink out of the West yesterday just as the signs were hammered into the ground on Friday. South Beach, Bill Baggs, Hobie Beach, Rickenbacher, Virginia Key... The list of banned riding spots keeps growing in Miami. This is a wake up call. We do not have the "right" to go kiting. We must cooperate and act in an organized manner in order to maintain access. Went to Hobbie today to try these new awesome kite boards! $550 complete 2011! and couldn't because of this new rules on the hobbie beach signs. What's up with this? When did this begin? Bigkite, I understand you want to show your boards by any mean but the pic you are posting is actually quite representative of the reasons why we have been banned. As this is a public forum, please take it out. I don't think we need this kind of publicity these days. Sorry BigKite, I tried to call you on the two numbers that I could find to discuss this but had no luck. Still, Tonykite has a point, this site is monitored by folks in the public sector. We don't want to make a bad situation worse. There's clearly a designated place on this forum to sell stuff yet this sales pitch/pics show up in 5 or 6 different threads that have nothing to do with selling stuff. I bet as soon as someone tries to enforce this the next post will be; " Whats's up with this, When did this begin? I can't sell my stuff any anywhere I want on a public forum that someone took the time to setup and organize?" If you thought about it you probaly can figure out exactly why kite boarders mess things up and loose access to public places. I can't believe that anyone is surprised by this closing. Look at any thread about Hobie and tell me you didn't see it coming. There are really a handful of people that were directly responsible for this and a very large handful of locals that simply left the "enforcement" to a few of us that care about access at this location. Teaching and riding close are the two largest offenses at Hobie. The management there asked all of us many times to police ourselves. We put their request of via this forum and others, but anyone trying to protect the area genarally got bashed. Do you think Patrick's photos of the idiot riding on the inside were too harsh now? We should have left them up and fired the idiots that couldn't control themselves. For those of you that are so against the rules of Matheson and Crandon, I guess you can see now why they are needed. It's just too bad that Hobie wasn't viable financially so that someone could have taken control and managed the area before this happened. Last edited by kent; 05-17-2011 at 01:53 PM. The city can not logically expect the community to police itself when the members lack the authority to enforce the rules. Now that it has gone past that, the law abiding responsible kiters are paying the price due to the city's failure to control the problematic kiters. I agree we should do what we can as a community, but some people just don't listen and beating them up, taking their kites, etc... is not something the community can legally do. Kiteboarding are paying tax citizens as well and simply banning kiting is not an acceptable solution, do not accept it as such!! At some point the city has to do their freaking job and use the authority that they have (not us) to stop the reckless ones and allow others to continue to have access. I'm not sure that you understand the situation exactly. #1: We met with cswy management several times to try to resolve the situation. They encouraged us to "self" police and gave us every opportunity to do so. I must say that we didn't get much support from anyone else to help in this effort. Aside from ASM, Rick, and a very small local riding group, everyone just thought that it would handle itself. The kite gypsy's kept teaching and idiots kept riding and jumping inside the marks. Management had no other choice but to enforce the rules. Had they left it as it was, something bad was bound to happen. This likely would have lead to other venues being closed as well. #2: There really wasn't any new law or rule made banning us from the cswy. The cswy is simply a right of way and nothing else. The ONLY responsibility that management has to the community with respect to this piece of land is keeping access to transportation open. Furthermore, unless an activity is "expressly permitted", it is prohibited. Kitesurfing has never been expressly permitted, but was generally allowed as long as it didn't negatively affect the right of way, permitted cswy vendors, or endanger beach goers. Unfortunately, we were unable to control our actions and despite numerous opportunities for our community to come together, we failed. The unfortunate part is that no one took this seriously until the closure. Just look back on this forum for about the last 5 years to see how many times we took the topic to task. Neither Adventure Sports nor Rick got much support in maintaining access on the cswy. Sadly, it is not even attractive for a vendor to apply for a permit similar to Matheson or Crandon as SW - W winds are very rare and the site is not suitable for instruction. Additionally, permits have already been given to vendors for kayak and sup rentals. I don't see that we have any real viable options to regain access at this venue anytime soon. For now, I can assure you that Miami Beach is on the block as are potentially Crandon and Matheson. What can we do? I don't ride at Miami Beach much, but if I did, I certainly wouldn't tolerate anyone teaching at this beach as it is too crowded to teach safely. Riders also need to ride farther offshore and take care to stay away from swimmers. At Crandon and Matheson, local riders need to abide by the rules and help to enforce them. Matheson is pretty much under control as the venue is quite small. Crandon on the other hand is often far out of control and I don't see many locals helping MKB to enforce the guidelines. It's everyone's beach regardless of who has a permit to do business there. We would all benefit to help both ASM and MKB to avoid accidents and maintain access. Next time you see someone riding too close to the beach and you find yourself quite, recognize that you are the problem.